​First conceived in 1997 David's Wedding Wish Vases have now been sent as gifts across the USA and abroad. Each porcelain vase is hand formed on a pottery wheel then trimmed thinly on the bottom panel and perforated followed by bisque firing. Decoration is hand painted and glaze fired to 2200F. Calligraphy lettering is applied and secured by a last firing. Vases are 10" to 11" tall and hold approximately 150 notes. Both of his parents were professional painters, so it was natural for David to follow in their footsteps pursuing art making as a life. Once he touched clay he found his medium! Primarily self taught, he has focused for many years, working with porcelain and under-glaze painting his wheel formed items with subtle floral decorations then high firing them to a luminous state. David's Wedding Wish Vases© have been a trademark item for him now for over 15 years. Years of pottery making, learning his craft and traveling to art shows along the Eastern Seaboard led to opening his own store with his jeweler wife, Molly Sharp. 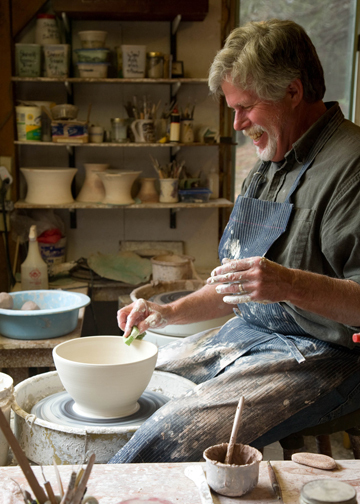 A new wood-fired kiln, volunteer work with Empty Bowls projects and teaching round out his full life as an artist. After 40 years, he continues to be amazed at the enjoyment found in the making and sharing of this beautiful art form.